Finer curls have a tendency to get weighed down by certain products, but this collection will ensure that doesn’t happen to you! Six different products best suited for finer curls that get weighed down easily. It includes a step-by-step instructional insert with tons of tips and techniques to help you get fabulous curl enhancement and definition. NOTE: 2 ounce collections are available in no-fragrance only. This collection includes Gentle Lather Shampoo, Aloeba Daily Conditioner, Too Shea! 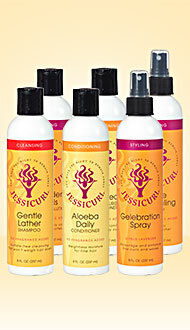 Extra Moisturizing Conditioner, Gelebration Spray, Confident Coils Styling Solution and Awe Inspiraling Spray.